Apple is sticking with a good thing, continuing the rollout of its "Your Verse" campaign with two new stories about how people around the world are using iPads as tools to support their passions. In one, Yaoband, a Beijing-based electro-pop group, use their gadgets to sample sounds, communicate with fans, and perform live while they tour China. 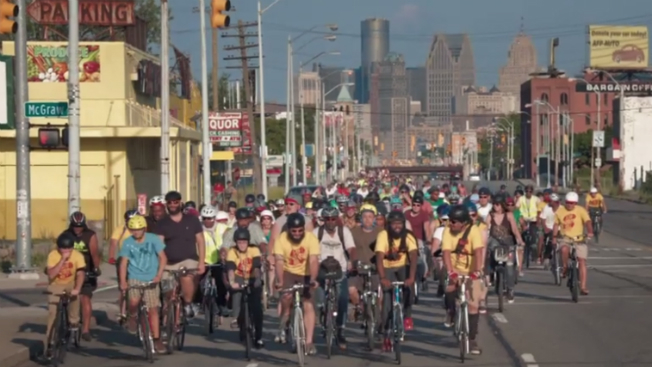 In the second, Jason Hall, a Detroit resident, uses his tablet to help organize Slow Roll, a weekly group bike ride through the city that draws thousands of cyclists, in an effort to help revitalize the city's sense of community. The 60-second TV ads for each, below, do get the ideas across, but they're really just teasers—the deep dives over at Apple's website make for less impressionistic and more powerful experiences. Even those are fairly ambitious, and rely on a premise that may not be obvious to anyone who hasn't been closely following the brand's advertising of late. The "Your Verse" tagline launched early this year by paying homage to Walt Whitman as brilliantly recited by Robin Williams, may he rest in peace, in the 1989 movie Dead Poets Society. It has since been the foundation for some of the brand's most persuasive ads in recent memory. But even to newcomers to the campaign, the takeaway should be clear enough, and feel consistent with expectations for good tech advertising: These are vignettes that illustrate how engineering can help enrich lives. Plus, it's nice to see Apple's marketing keep reaching high while also staying grounded. Especially when that's what people expect—or at least hope—to get from the brand.